One year ago from today, LEGO Friends was released to the world and we are thrilled to be officially launching this site in celebration of this momentous occasion! If you’re already a regular visitor, we thank you and hope that you are enjoying all that we are sharing with you so far. And if you’re new and just checking us out, we hope that you like what you see and plan to re-visit often…especially since we’ve got lots of fun things in the works including contests and giveaways! And with that being said, we’re having our very first giveaway right now! #1: Register on the site AND comment on this post that you’re reading right now. One commenter will be selected at random as the winner. The prize? 1 copy of 3185 Summer Riding Camp (MSRP $99.99). #2: Like us on Facebook. One liker will be selected at random as the winner. The prize? 1 copy of 3315 Olivia’s House (MSRP $69.99). #3: Follow us on Twitter. One follower will be selected at random as the winner. The prize? 1 copy of 3189 Heartlake Stables (MSRP $49.99). You can enter all three giveaways but you can win only once and you have until 11:59pm PST December 31, 2012 to enter. We’ll pick the winners and announce their names in early January and get in touch with them by either email, facebook message, or twitter direct message. There’s already so much to celebrate this time of year and we’d like to add a few more reasons…Happy One-Year Birthday, LEGO Friends! This entry was posted in Giveaways, News by PeppermintJabby. Bookmark the permalink. I am commenting on this post that I am reading right now! Yay for a year of LEGO Friends! It is nice to see a blog for my little girl to be interested in for her LEGO Friends sets. My girls love Friends. It’s great to see them having so much fun building like I did at their age. Is PeppermintJabby the alter-Friends-ego of an FBTB staffer, or someone new? I’m glad to see some unbiased views. My daughter loves them right along with all the other Lego. 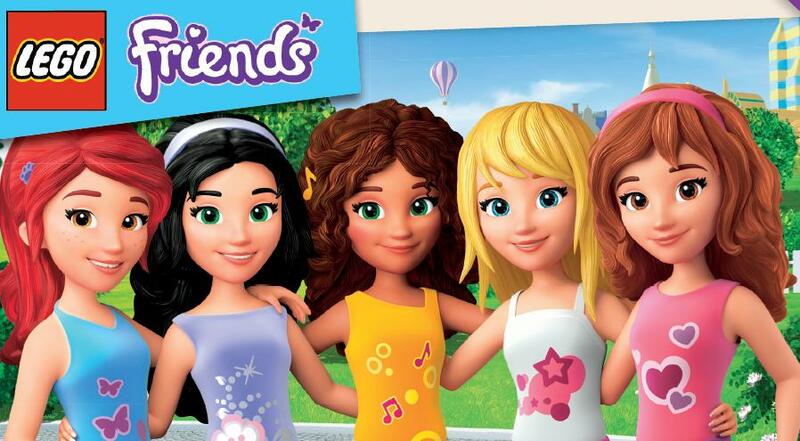 My 6-year-old daughter LOVES Friends, so I’m really glad to see this new site! Happy 1st Anniversary, Friends! I’m bothered by the holes in the hair pieces. Seems longer than one year that Friends has been out. I’ve picked up a few of the littler sets for my daughter. She seems to like them so far. LEGO Friends is truly underrated and not deserving of the controversy it’s gathered. Hopefully, we’ll be able to look at this sub-line objectively. These are such cool sets. Congrats on a successfull year LEGO Friends! Yeahoo! Happy Birthday LEGO minidolls! Lego Frends got my girls into Lego. They love all sorts of lego now, but thanks Friends. As a father of three girls, I think the sets and the line are fantastic. It even got my wife to start building! My four year old daughter had really enjoyed building the mini-rooms. Starwars and Friends…. This is my house. FBTB for the SW fix and now Heartlake for my Daughter’s growing obsession. I’m stocking up a few sets for my 4 year old niece, who is still building with Duplo, but making the transition to my collection of minifigures. I got the seaplane set for myself, I’m a plane nut. Good to see someone finally start a Friends blog. There have been some really great customs and MOCs built around Friends, plus just a site for news, and someone to cover all of the protests. Just as a heads-up, one of the cross category awards in the annual Colossal Castle Contest is for best use of Friends elements. There have been a few subtle uses, like the new flowers in one MOC and a hedgehog hiding in another. Fraslund turned a minidoll into Joan of Arc. I actually like the addition of the friends line. It adds more color elements in colors we’d likely not see. I hope it continues myself. My daughter loves the Friends line and they do make some awesome sets. Cool! My daughter will be excited about a Friends flavored blog. Comment comment comment! 🙂 Happy birthday! I’m glad to see this site! I think Friends has been the best thing that’s happened to the “girl” sets in a long time. Thank you! A place for Lego Friends news! Yay for more lego blogs! My 4 years old daughter really likes the Lego Friends sets so I will follow this blog. I am commenting so you can give me free Lego ….. I mean yay for Lego friends! I just bought two Friends sets for my wife this Christmas. I like that they have such a wide range of colors that normally aren’t found in other Lego sets. I wish this site and the line a long life as I would like to enjoy playing Friends with my daughter! I took my daughter to a Lego store for the first time this year. Guess which sets she went straight after? All those people griping about how this enforces gender stereotypes need to get a life. If a kid likes it who cares? Love this line. Good stuff. This site could really breathe some fresh air into the AFOL blogosphere. I’ll be checking it out! Would you like some help in the site’s theme design? A little more visual umph seems to be appropriate for A site about Friends. I’m interested in helping if you’re into it. May LEGO Friends be the gateway to LEGO for girls everywhere. Happy 1st B-Day! Happy 1st Birthday… its good to have Friends! Happy 1st Birthday! I think this is one of the better themes to come from Lego in some time and I hope it continues for many years. Great new blog guys! Best of luck! Nice to see a Friends blog. My kids love Friends. And I love the parts! We need more red hair! Awesome idea for a blog. Good luck with the new endeavor! My daughter will love this. Happy Birthday! Congrats on the new blog! My daughter will no doubt enjoy this site to find new and exciting ways in which to spend her (my) money. Looks great! My daughter really enjoys Friends. She plays with her brother’s Legos but she keeps her Friends sets separate for her own building & playtime. As a AFOL, I’m slowly warming up to Friends. I’m trying to buy some sets at discount. But surprisingly there aren’t much discount for Friends anywhere. Here in Singapore, most of our departmental stores are out of Friends sets. im so glad for a website that loves friends! my granddaughter, a teen, and love the friends lego! Great to see the Friends LEGO doing well, my daughter loves these sets. It is great to spend time building LEGO, something we both enjoy! Way to go Lego Friends! Great to see a site dedicated to Lego friends. My daughter loves it! My daughter and her friends are thrilled to have Lego Friends to enjoy. My daughter loves the Friends. We corrupted – errr – started her early (around 18 months). She loves to play with them as well as Star Wars, Superheroes, City, et al. She likes to mix themes too. Nothing with Batman cruising for criminal’s in Stephanie’s convertable, right? My wife loves this theme. It’s gotten her to start building some. She loves the advent calendar as well. We both hope Friends keeps going for some time. My daughter loves these sets (of course she loves any LEGO). My kids and I are LEGO Friends fans. Thanks for making this blog! I daughter has been very happy with the addition of lego friends. I’ve already started stocking up on Friends for my 17-month old. I just with they used the same horses as regular Lego. My family is super proud to be Lego supporters, and I am glad that the Friends line appears to have so much support. I hope it continues for many years to come. My ten year old daughter really enjoys the Friends line. She spends a good deal of time building with her brothers now. Happy anniversary Friends. Thanks Lego too, our daughters love the range and the controversy makes no sense. As I said on fbtb.net,this site is a great idea. My 6 year old loves the line and her brothers enjoy helping her build plus it keeps her out of their LEGO. Happy Birthday Olivia, Stephanie, Mia, Andrea and Emma! Love the friends sets. They are so pretty and I love building them with my husband and son. Its nice in wake of all the controversy about these to have site deliver an unbiased view. Great Site! My daughters love Lego Friends. I personally don’t like the mini dolls because they can’t do as much as the mini figures, but we still play for house with our Legos. LEGO Friends are cool – my 7 year old daughter loves them, right alongside LEGO City, Star Wars and all of the other LEGO sets she and I play with together! I love the new Friends line! I can’t wait to expand Heartlake City even more this year. Great site. Looking forward to visiting often. I’m looking forward to coverage of Friends MOCs here! Also, Stephanie’s Cool Convertible might have been my favorite set of the year, definitely top 5. I bought 2! These sets are fun. Good to see them getting some positive attention. I’m glad there is a place dedicated to Friends fans. Friends has helped my daughter feel she has something special in Lego and her brother loves the new parts, colours and opportunity to help his sister build! Let’s hope Friends turns out to be a longrunning theme..just like city, or space! This site is a great idea. I buy Friends sets for my nieces, so it’s nice to have a resource dedicated to that. Excellent move on Lego’s part. While girls could play with “traditional” Lego, the fact is they didn’t. My daughter was luke warm about her brothers’ Lego until Friends came along, now she’s a fan. What can I say Friends is a success story. This new blog seems to be a pragmatic endeavor. My daughter (4.5 yo) is on the fence about Friends, but I am happy to see the sets seemingly move away from totally “girlie” stuff toward more real themes (like soccer) and hopefully incorporate more substantial builds instead of so many very small pieces. Excellent line. TLG has the potential with Friends to put out a line with as much playability as any theme currently being produced. Monsters, aliens, and what do you know? They added girl Friends to the universe of LEGO! And thanks for the new elements and colors especially. Has it been a year already? How time flies! I will certainly be coming here regularly. I just found the site, but read through all of the existing posts, and like what I see. My daughter is really enjoying Friends over other toys. She likes farming and is a big fan of tractors as well as playing with dolls. With Friends she isn’t confined to the product line. She can build whatever she wants to imagine. my daughter would LOVE this so very much. happy birthday to lego friends! Completed all three steps 🙂 fingers crossed! thanks for the news. i’m particularly thankful for the sale notices. the Friends line has some awesome pieces. Friends is a cool line, but I still think that LEGO could market regular sets and minifigs to girls; just put more female figs in sets. I have talked to numerous girls who love LEGO and use the minifigs as dolls. My daughter loves Lego Friends. Lego Friends rock! Just watched my 7 year old daughter build the Friends seaplane all by herself. Olivia is living in her invention workshop, she needs a house. Got my first Friends set for Christmas–despite the minidoll’s lack of articulation compared with a minifig, I adore her utter cuteness. Excited for a LEGO Friends blog! I’ve become. A huge fan of the theme. I would love the set for my little girls! Here’s hoping Friends and the Minidoll are here to stay! You’re doing a wonderful job, keep it up. I’m really looking forward to tear two. Thanks for the opportunity to win a cool set! Friends – growing the F in AFOLs since 2012! About time Friends got its own website! I’m always interested in new LEGO themed websites. I’ve just discovered the awesomeness of Lego for my little girl. Let there be more Friends! Awesome. My daughter enjoys all lego, including lego friends. She identifies and appreciates with the friends lego because it’s about girls, but she loves all the other ones to play with probably more. I think both are great. First I was very negative toward this another try at stereotype girls toy. But then I put it aside and saw some of the real value and difference in this new theme. Now I think I get it and I can see my own girls age 4 and 2 enjoying it and more importantly to me, combining it with all the other Lego we have. And thanks for building this blog for this theme! Appreciated ! Liked and subscribed! My daughter and I are big Friends fans, and I’m looking forward to seeing what other folks are doing with it. Thomas Main’s City Park Cafe addition (linked here in the comments) is the sort of thing I’d like to see! Happy Birthday Friends… soooo many sets, its awesome! My daughters (3 and 5) love LEGO Friends. With only a little influence from me. I love friends and need to enter for #1! Hard to believe Friends is turning one year old already. I remember going out with my daughter to buy her first set – The Heartlake Vet. Who knew that would be the first of many… and still going strong. Looking forward to this new blog! has it really been one year already, wow. I’m excited for the new Friends sets! Happy Birthday LEGO Friends! We love this theme in our house, even my son! I remember the controversy when this was announced, but also remember my daughter passing these sets in the store. She stopped, she looked, she saw a LEGO set designed for her. She enjoys the Friends sets, but now also likes the “regular” LEGO sets and mixes/matches as she has the urge. I watched the new (?) Friends show on TV the other day with my daughter… not bad. Can’t wait to show her this website. Oh, I’d love to win one of those sets! =) Nice blog! As a long time AFOL, I was worried that my love of Lego wasn’t going to be picked up when I had 2 little girls… Lego Friends has ensured there’s something there for them to love! Great idea, great site. My wife loves these friends sets! Yay for one year! Happt birthday Friends! Happy Birthday to Friends! As A huge AFOL, I am in love with this theme and hope to see more sets and varieties of parts! I don’t know why there is so much controversy over the theme, but to me, the Friends line has been a MOCers Dream to me. So many new parts, and colors! If any of you were at Brickworld you would have seen what sort of MOCs are possible with this theme with my “Apocalypse Heartlake City” Display! I love friends and the site! I love LEGO Friends. I’m an AFOL and these sets really help my MOCs! Happy 1st Birthday, Friends! Here’s to many more to come. Thanks for recognizing the popularity of Lego Friends. And, thanks for creating an opportunity to win Lego! Friends is new to our family and has become an instant hit. We look forward to what your site has to offer. Finally a site for all things LEGO Friends! My daughters love these sets and while I prefer star wars and the modular city sets being a guy I have enjoyed my girls getting more into LEGO and bringing their ‘lego friends’ to play in the modular city. Just this evening, I was thinking “Where is the blog obsessively devoted to Heartlake Friends?” And up pops this one on Brothers Brick! I just found this site– happy anniversary! It’s so nice to say my son’s AND daughter’s favorite toys are Legos! What a nice blog find. Love this blog! Just found you via the Brothers Brick. My Diva loves her LEGO Friends – glad to find a blog devoted to the product line so we can keep on top of things. Thanks for all your hard work in making this site. My daughter and I are very happy to find a site dedicated to Lego Friends. Happy 1st birthday Lego Friends! Loved LEGO Friends from the moment they announced it. Even had them set aside money for it at work (after-school-care) so we could buy all sets as soon as they came out! And the sets only seem to get better! This would be amazing! Love Lego Friends! Blog and doing this contest! Love the Lego Friends and love reading your site with my Friends-Fan daughter! thanks for putting this site together… you guys do a great job. I’ll definitely review it on a regular basis. Happy Birthday to Olivia and all her friends! I’m surprised it’s been a year already. I remember reading about the controversy on Jezebel. I wonder if Lego has additional plans with the “Friends” line,like a TV show, or is it planning to have more themes like this?